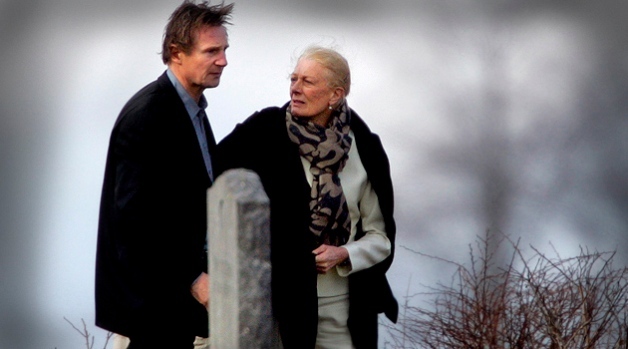 Liam Neeson, a pallbearer for his wife' coffin, arrived at the tiny church in upstate New York with his two sons and mother-in-law, Vanessa Redgrave. Natasha Richardson has been laid to rest in the tiny town where she raised her two sons and near the home where she exchanged vows with husband Liam Neeson. 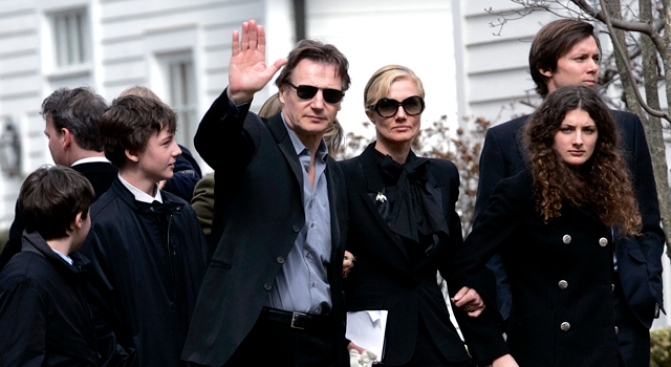 Neeson was one of six pallbearers who carried his wife's mahogany coffin into St. Peter's Episcopal Church in Lithgow, N.Y., for the private afternoon funeral service attended only by family and close friends. The heartbroken widower arrived at the tiny clapboard church wearing a dark suit and sunglasses along with his teenage sons and mother-in-law Vanessa Redgrave. Ralph Fiennes, Uma Thurman, Laura Linney and Timothy Dalton were part of a solemn procession of roughly 40 mourners that streamed into the small church for the private ceremony around 2 p.m., the Poughkeepsie Journal reported. Richardson was buried next to her maternal grandmother, Rachel Kempson Redgrave, in a cemetery surrounded by rolling hills dappled with horse farms about 90 miles from New York City. Cemetery workers began the grim task of digging Richardson's grave around 9 a.m. today, the New York Daily News reported. The mahogany casket emblazoned with a claddagh symbol that carried Richardson's body made the 90 mile journey from Manhattan to Dutchess County after a wake yesterday. "Liam Neeson, his sons and the entire family are shocked and devastated by the tragic death of their beloved Natasha," a family spokesman said following Richardson's death. "They are profoundly grateful for the support, love and prayers of everyone and ask for privacy during this very difficult time." Richardson was brain dead after suffering serious head trauma during a freak ski accident on a beginner slope at a Canadian ski resort last Monday. Her family made the gut-wrenching decision to pull Richardson off of life support 48 hours after she was first hospitalized.